Lee Woodruff’s latest book, Those We Love Most, is about family, love, tragedy, coming together and healing. In short, it holds a reflection of all of our lives. So this week’s Sunday Supper theme was born…. Comfort Food Recipes. 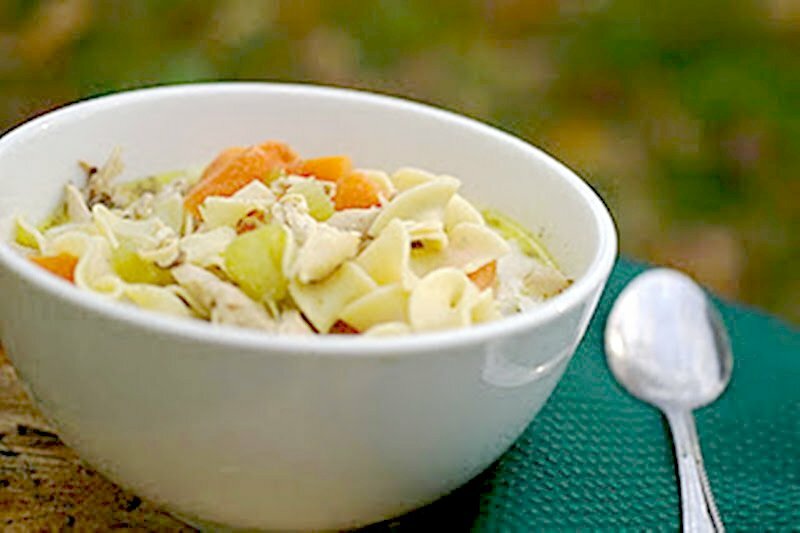 For me nothing is more comforting than a hot bowl or cup of homemade chicken noodle soup. You know the kind, with big chunks of chicken and wide hearty noodles. We will also be giving away 5 signed copies of Those We Love Most. I am sure you are wondering like everyone else how can I get my copy? All you have to do is join Lee and our Sunday Supper Team during our chat tonight at 7pm Eastern Time. Oh and share your favorite comfort food. That is really all you have to do. So get those finger muscles in shape for our chat tonight. Add all ingredients to a stock pot. Cook chicken until tender about 45 minutes to an hour. Remove chicken and allow to cool. Strain out everything and put the broth back into the pot. Put stock back in pot for the soup. Allow chicken to cool. Remove and discard bones, grizzle and skin. Cut chicken meat into bite size chunks. Set aside until ready to use. We would love to have you join Lee and our Sunday Supper Team during our chat on Sunday at 7pm Eastern Time. Wait till you see the comfort food recipes our talented Sunday Supper Contributors will be featuring. Pairing Wine with Sunday Supper Comfort Food Favorites! by ENOFYLZ Wine Blog We would be honored to have you join us on Twitter throughout the day during #SundaySupper. We’ll be meeting up at 7:00 pm(Eastern) for our weekly #SundaySupper live chat where we’ll talk about our favorite Comfort Food Recipes. This takes me back to my mom’s good ol’ fashioned Chicken Noodle Soup, your right it’s comfort food! Still to this day I WANT mom’s soup when I’m sick. Thanks for sharing your recipe! Chicken noodle soup is the ULTIMATE comfort food…I’m loving your recipe! Happy #SundaySupper! ahh… chicken noodle soup. What could be more comforting? Love that you shared during #SundaySupper. My son would love this. This is the classicl comfort food for anytime of the year! Yours looks great. Is there anything better than a bowl of chicken noodle soup on a cold day? I don’t think so! It is definitely one of the definitions of “comfort food” for me! 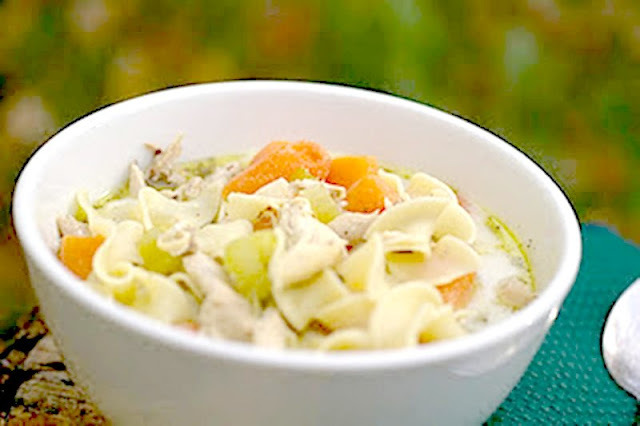 Chicken Noodle Soup is on of my all-time favorite comfort foods!! It really does have healing properties. Beautiful bowl full, wish I could reach in and devour it. I can’t wait for the cold weather to arrive so I can make a big pot of chicken noodle soup for the family. Love your pics! What is more comforting than Chicken Noodle Soup and yours looks perfect!! I think chicken noodle soup is what comes to mind first when someone says comfort food. It looks truly wonderful! ooooo…i like the touch of cream! sounds and looks great! I manage too cook almost everything with white wine, yet I never thought of putting it in my chicken soup! Definitely want to give this a try. Yep, chicken noodle soup is a real comfort food. Love it, especially when I have a cold or not feeling so good. I think it is medicine all by itself. This almost, almost makes me want to have a sick day! Under the covers with a bowl and crusty bread. hmmm. I love that it is almost soup weather. Nothing says comfort like a bowl of chicken noodle soup! Love this post!!! Chicken noodle soup is the epitome of comfort food. Your recipe sounds delish and your soup looks amazing. Lovely Chicken Noodle Soup! Comfort food at it’s finest. I believe this is the ultimate comfort food. Nothing makes me feel as good as a nice, hot bowl of chicken noodle soup. Homemade chicken noodle soup (or turkey noodle soup) is one of my husband’s ultimate comfort foods. He LOVES it when I made it. I’m really loving your version…I’ve never put yummy stuff like parmasan cheese, cream, and wine in mine! Homemade chicken noodle soup is my ultimate comfort food. Classic yummy recipe. Thanks for sharing! Delicious looking recipe! Wish I had this for dinner tonight. The epitome of comfort food if you ask me. Love how pretty and hearty this is. Great job on this week’s theme Veronica. I love soup weather, and this is the perfect soup for comfort food. Love all the noodles! I adore chicken noodle soup, and yours looks perfect! I love chicken noodle soup, especially the kind that is more ingredient than broth. It looks like you do just that! Chicken noodle soup is one of the all time comfort foods!! Great recipe and such a wonderful photo!! Amazing! I could have this for breakfast, lunch, and dinner! This is my kids’ all-time favorite soup. Whether it’s 100º or 40º outside, my middle-child will eat chicken noodle soup morning, noon and night! YUM! Chicken noodle soup is one of those essential Autumn dishes for me. So simple and hearty, perfect for cold dark nights. I love chicken noodle soup, especially when I’m sick. Your version looks perfect! Chicken noodle is one of my favorites and I have never made my own, I will try this one for sure when I do. I’d love to this fall especially when it gets colder out. Thanks for the recipe 🙂 Great pictures! Seriously, I think there isn’t anything that screams “comfort food” more than chicken noodle soup! I must confess I’ve never made homemade chicken noodle soup. Mostly, I think, because I tend to only consume it when I’m sick. But your recipe and the photo make me want to reconsider. I love how it looks PACKED with veggies, noodle and chicken. You won’t get that out of a can! There is nothing more comforting and heart warming than a big bowl of good chicken noodle soup. Your soup looks so hearty and welcoming! Chicken Noodle Soup! Classic and wonderful! Can’t beat good ol’ homemade chicken noodle soup! That is the definition of comfort. This sure is a different spin Veronica! Sounds awfully good! I have chicken noodle soup going in the crockpot right now! I’m too lazy to deal with bones, so I use boneless skinless, Yours looks great! Sounds & looks very flavorful ! Nothing like chicken soup to calm the soul ! Yummm !